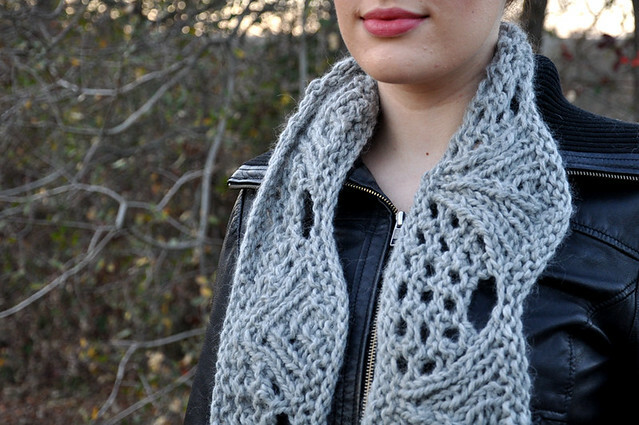 This is the last of my holiday freebies, and it’s the perfect quick knit. It only takes one skein of Plymouth Yarn Baby Alpaca Grande, and the cowl can be knit in the amount of time it takes to watch a movie if you’re a fairly fast knitter. 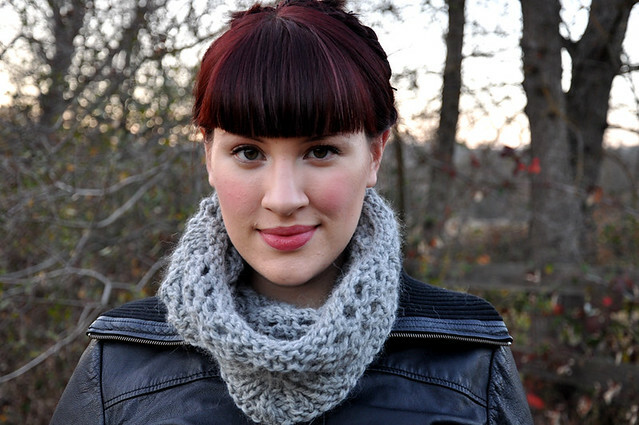 The finished cowl is long enough that you can loop it around your neck twice and get nice and cozy. If you use the recommended yarn, you’ll be tempted to snuggle your face in the cowl when it’s cold out because the yarn is so buttery soft! If you happen to be a fan of red lipstick like me, you might want to avoid that temptation or use a darker color of yarn if you don’t want to end up with red stains on your cowl. That happened to me recently, but I haven’t attempted to get the lipstick marks out. I’m hoping they’ll come out, but ideally that scenario should just be avoided. 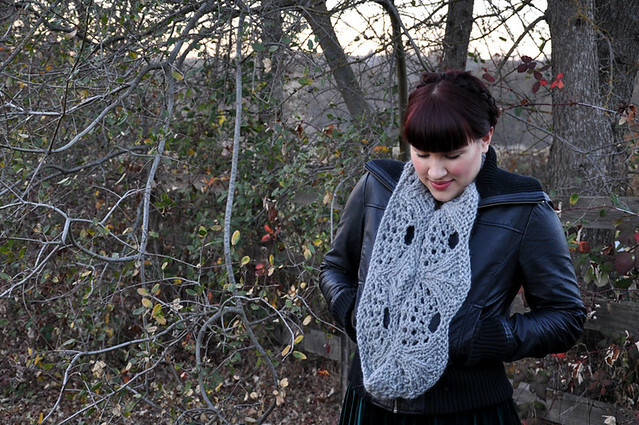 The pattern is free until January 1st. You can download the pdf by clicking here or take a look at its Ravelry page. Gorgeous pattern – thank you for the gift! I REALLY like the uniqueness of this pattern. Not seen anything like it before. Love the webby lace looks mixed with the solid areas. And the fiber looks warm! gorgeous!! It looks cozy and elegant, all at once! Ooh, so pretty! Definitely going to knit this one! Thank you! 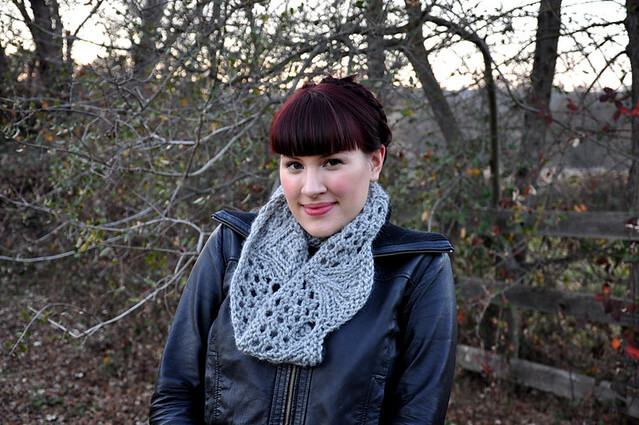 This cowl looks so great! I love both the pattern and the yarn color. I still have to finish knitting a sock for my mother’s christmas present, and then I’m done! I will give a try to your pattern next year. Thanks very much! This is really lovely. Wait. It’s still jan 1 and the pattern is no longer available? Can you send me the link? I love it. Sorry! You’re a little too late. The pattern was free until the first, not through the first. You can still get it if you follow the link to Ravelry, but it’s $5 now. This is beautiful. I enjoyed knitting it today. However, 1 skein was not enough for me. I had to bind off while doing row 18 to have enough yarn. Just wanted you to know. I’m sorry to hear that! 110 yards of Plymouth Baby Alpaca Grande just barely should give you enough yarn to finish the pattern, but it’s so close to using the very last bit of yarn that if your gauge isn’t spot on or if you substituted a yarn that drapes differently, running out of yarn is a real possibility. Thanks for your comment. I did use the same yarn you called for. I just thought you might wish to mention in your pattern that it is indeed close and purchasing a second skein might be advisable so as to not be disappointed with the results. It really is beautiful and I decided to get a second skein tomorrow to finish it according to the pattern. I’ll add a note on Rav! Thanks for your feedback. Forget the knitting. YOU are the star. You are so photogenic you should be modeling like crazy. ps knitting is cute too. Came across this pattern (Salt) and I have this yarn in my stash, so I’m excited to make up some for Christmas gifts.